There is just something about a little kid whose brain remains uncontaminated and is full of wonder about the world around him or her. Their imagination, too, tends to wander to far off places that we adults have seemingly lost such magic already. 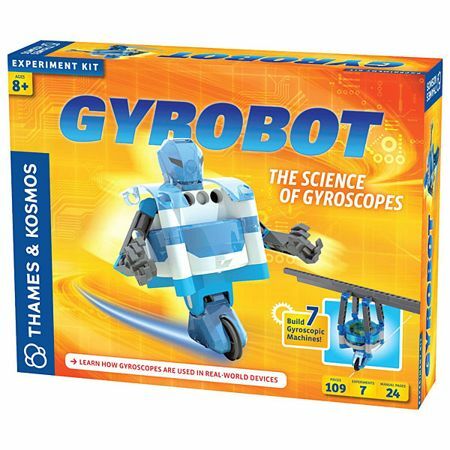 How about influencing their thinking and awakening their dormant engineering spirit with the $44.99 Gyrobot? This unique purchase for your little one would allow them to build 7 different machines using all the included parts, where there will be 102 pieces in total alongside 24-page instruction manual that you might want to go through with them so that they know what they’re doing. After all, since your kids play with devices that have gyroscopes each day, ranging from their consoles to smartphones and tablets, why not introduce them to building a robot that has a gyroscope within instead? This is what the Gyrobot is all about, where the basic concepts of inertia and angular momentum can be learned, and with 7 different machines that the kit allows children to build, they are able to observe and experiment more evolved concepts from a first person perspective. Powered by a trio of AAA batteries, your kids would have a fun time building machines such as a gyroscopic robot, personal vehicle, gyro horizon, gyrocompass, balancing game, tightrope walker, and flight simulator.